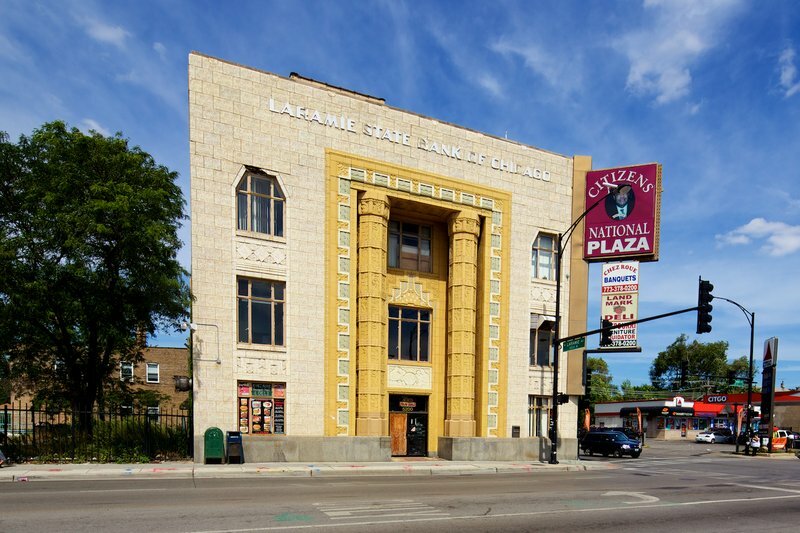 The Laramie State Bank building, an iconic landmark in Austin for decades, has been added to Preservation Chicago’s annual list of endangered buildings for 2019. Years of vacancy, too little maintenance and a hole in the roof threaten the future of this multi-colored terracotta building that has stood at 5200 W. Chicago Ave. since 1929 and was designated a Chicago landmark in 1995 due to its iconic Art Deco style. According to an inspection done in 2017 by the Chicago Chicago Department of Buildings, the structure suffers from a number of issues with its water systems, elevators, doors, windows and exterior. A court hearing held in September 2017 put a spotlight on the building, with its owners, city officials, concerned residents and preservationists all there to hear about potential redevelopment of the site. Preservation Chicago would like city officials to consider using funds from Chicago’s Adopt-a-Landmark program to repair the hole in the roof and fix other problems. “It always has been a show stopper of a building. It really takes your breath away,” said Preservation Chicago executive director Ward Miller, who cites the multi-colored polychrome terracotta, with hues of yellow and green, as cutting-edge historical architecture for the early 20th century. Miller says Preservation Chicago is working with its sister organization, Landmarks Illinois, and the Chicago Department of Planning and Development to figure out how the Laramie State Bank Building can best contribute to the community. So far, a handful of models have been proposed for restoring the building and putting it back to use. Some of these options include opening a community center and small grocery store in the former banking room, or putting housing and/or offices for social services on the upper floor. To do this, adjacent properties would need to be acquired, Miller said. Preservation Chicago hopes to acquire the surrounding parking lot and vacant spaces that would be used to build new properties that would attach to the bank building. Repairing the hole in the roof would prevent further water damage to the building and keep the terracotta stable, though Miller said he doesn’t know the extent of the interior damage, because the building has been sealed off. That’s why the Austin building was included in Chicago Preservation’s annual list this year. “There are many people that live in the city that may not pass Laramie and Chicago Avenue … we thought this building being in the Austin community highlighted in such a way may bring about a good outcome if someone wants to step forward and get involved in this project,” Miller said. He’s not aware of anyone who wants to see the building demolished and is hopeful for its future. For the first time in the citywide festival's eight-year history, 11 locations in Austin will be featured. The Austin landmark’s deteriorating condition will be discussed at 2 p.m. Sept. 6 at the Richard J. Daley Center. Some West Siders hope the building, located at 5200 W. Chicago Ave., will be put back in use for the community.